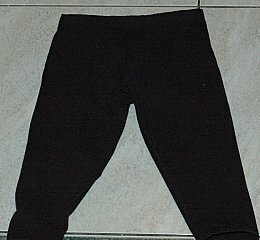 For this shorts project, we made a pair of pants, instead of shorts, for a little brother. We used Dad's old t-shirt. You can use these directions to teach you how to sew pants or shorts. This will be one leg. 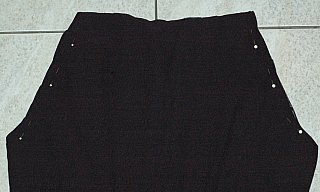 You will trace around the shorts with your fabric pencil but add 1/2 inch around your pants for a seam allowance. Otherwise your pants or shorts will be too small once you finish sewing them. 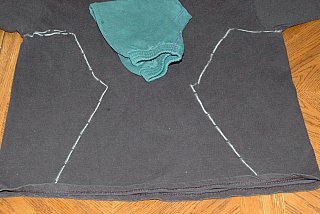 Use the bottom of the shirt to be the bottom of your shorts so you have a hem already done. Flip the shorts to the other side and trace around the shorts with your pencil. Cut two pant legs out. Unfold two pieces and place right sides together. Pin along curves. Sew along curves. You just sewed the front and the back. Now straighten the legs out so they are lying flat, with right sides together. Sew the crotch seam. Turn the top edge down 1/4 inch and then down again 1/2 inch. Pin in place. You are making a casing that you will insert your elastic into. Sew along edge taking out the pins as you go. Leave a 1-2 inch hole for inserting your elastic. When both ends are out pin together and try your shorts on to make sure they fit comfortably. Trim any excess elastic if needed. Pull elastic out slightly so it is easier to work with. Sew two ends of elastic together by stitching and backstitching several times to make secure. Stretch elastic back into waist and top stitch opening closed. These are the general instructions to how you sew pants. When you are using a pants pattern it will be the same procedure. 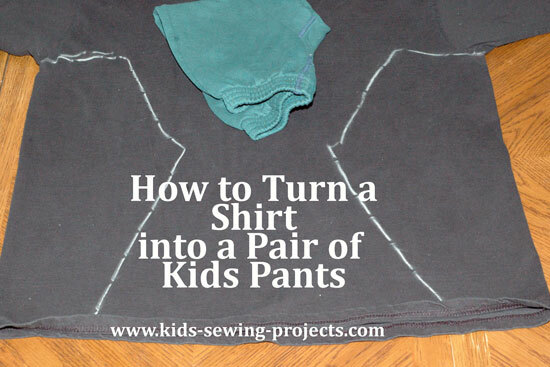 Changing a shirt into shorts also works great for sewing toddler or young children's clothes. Try making something for a young child you know out of something you no longer wear. You can also do this with pants depending on the size of the child. Back to Sewing Lessons 4 from Shirt into Shorts Project.